Never in the history of democracy had a leader remained strong and relevant for half a century as Kalaignar did. He was a strategist in the Chanakya mould. Muthuvel Karunanidhi, “Kalaignar” as millions affectionately called him, dominated the politics of Tamil Nadu for five long decades — from 1968, when he became chief minister, till 2016, when he took ill, which disabled him from active public life. No other political leader had such a long and imposing relevance in a party and in the state. From the age of 14, when he became active in public life, till December 2016, for 78 long years he worked ceaselessly for the cause he believed in, for the party he led for 50 years and for the governments he led five times as chief minister. Never in the history of democracy anywhere had a leader remained strong and relevant for half a century as Karunanidhi did. In the seven-plus decades, the man did the work that most would not in twice the number of years. Karunanidhi was indeed a human dynamo. A strategist in the Chanakya mould, he was an unparalleled organiser and matchless manager of the masses. A born politician who aimed to win, Karunanidhi — the media called him MK — vaulted over his seniors when the man who built the DMK, C N Annadurai — ‘Anna’ as he was lovingly known — died. MK was then just 44. Hours after the demise of the towering Anna, MK virtually filled the void in the minds of the powerful DMK cadre with an audio tape of his brilliant poetic tribute to the departed leader he had worked on in advance, even as Anna was terminally ill. The audio tape mesmerised the cadre and put them in MK’s lap, leaving senior leaders like V R Nedunchezhiyan, K A Mathiazhagan and N V Natarajan nowhere in the reckoning. That single brilliant strategic move made MK their natural choice. With M G Ramachandran — MGR to millions — who alone could have thwarted the succession plan, putting his weight behind him, MK succeeded Anna as chief minister in 1968. Within a couple of years he became the tallest leader of the party, sidelining and dwarfing all others. 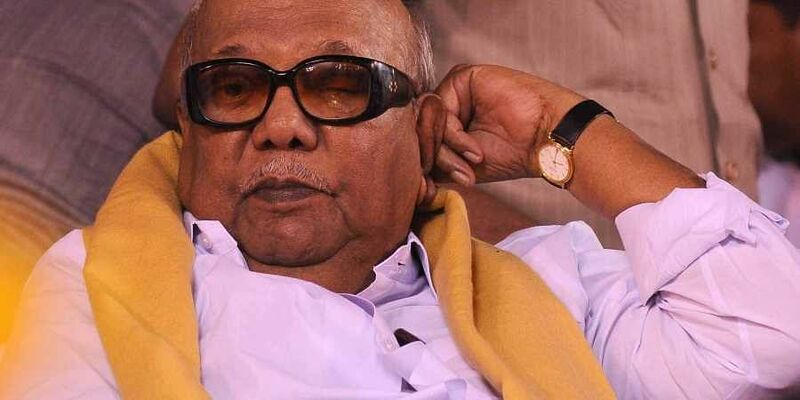 Then came the best opportunities and the worst challenges, and the way MK navigated the DMK through both in the 1970s and early 1980s is a lesson for political strategists though it may be abhorrent to puritans in politics. With the monolithic Congress splitting in 1969, MK tactically allied with the faction led by Indira Gandhi, held the Assembly and parliamentary polls together in 1971 by offering 10 Lok Sabha seats to the Indira Congress but no Assembly seat to it, thus wiping out the Syndicate Congress and winning a huge majority in the Assembly. While the alliance once and for all compromised and diluted the DMK’s ideological position, it also made MK the unchallenged leader of not only the party, but of Tamil Nadu as well. However, when he began downsizing the other tall leader, MGR, within the party, the latter revolted. MK strategically co-opted the very senior leaders he had sidelined with MGR’s help, expelled MGR in 1973 and regained control over the party. MGR formed the AIADMK and won the Dindugul parliamentary bypoll with a massive majority, which challenged the DMK’s hold over the state, but not Karunanidhi’s hold over the DMK. By then the DMK had become totally dependent on him like a honeybee falling into a honeypot. Then came the toughest test of his career, the Emergency, when Indira Gandhi did to him what he did to MGR in 1973. She sacked him as chief minister, imposed President’s rule and instituted anti-corruption inquiry against him. In the 1977 Lok Sabha and Assembly polls in Tamil Nadu, MGR allied with Indira Congress and won a majority in the Assembly and the alliance swept the Parliament seats, while the DMK, which allied with the Janata Party, came a cropper. But MK soon got his opportunity to turn the tables on MGR. When the Janata Party split and the Morarji Desai government was facing a no-confidence motion, MGR committed the worst folly of his life by voting for the Janata party. The government lost the no-trust vote. Charan Singh became Prime Minister, but the Congress pulled the rug from under his feet within months, like it did later with Chandrasekhar, H D Deve Gowda and I K Gujral, and forced Lok Sabha polls on the nation in early 1980. Here again, seizing on MGR’s slip of turning against Indira and supporting the Janata Party, MK brilliantly timed his tactical shift and switched sides to Indira Gandhi. It suited a waiting Indira Gandhi who gladly welcomed him back, ignoring his earlier hostility. All her earlier charges of bribery against him, too, were brushed under the carpet. Both joined hands and trounced MGR in the Lok Sabha polls. But when the AIADMK government was dismissed and Assembly polls held within three months of the Lok Sabha polls won by them, MGR trounced both and captured power again, which no one, especially MK, had expected. Had MK’s strategic alliance succeeded in the Assembly polls like in the Lok Sabha polls, MK would have wiped out the AIADMK and emerged as the unchallenged leader of Tamil Nadu again. With that win, MGR pushed MK, as the latter himself used to say, into agnyatavasa (political exile) for eight more years, till MGR’s death. The way MK fought to protect the DMK against the MGR phenomenon in this period was an example of leadership in the times of adversity. Thereafter it was a tussle between the DMK led by MK and AIADMK led by Jayalalithaa where power kept shifting between the two, through 1991 to 2011 in each Assembly election, though Jayalalithaa arrested the trend and narrowly retained power in 2016. The DMK’s failure that year was also because of MK’s failing health, since he could not campaign effectively. Assessing MK is not easy. But anyone who dominated a state for 50 years needs to be analysed. After being in and out of hospital for almost 18 months from December 2016, MK was interred on August 8, with the media unanimously describing it as ‘Eternal rest for the man who never took rest.’ That best captures his life more than any other tribute. His hard work qualitatively vaulted over the quantitative limitation on time, which enabled him to accomplish in a day what a thousand others might not, even in a month. He was relentless thinker, ceaseless reader and unceasing writer. A multidimensional mind, MKs’ shadows extended long beyond his main domain of politics into literary, poetic, cinematic, artistic and musical fields — of course exporting his political ideas to those apolitical territories. In power or out of it, he was unprecedented in his responses to situations, which kept him far ahead of his competitors within the party and outside. His day would start a couple of hours before sunrise with politics and end again in politics several long hours after sunset. He would have completed reading the morning papers by the time his colleagues would not have even brushed their teeth. The telephone of any colleague faulted by any newspaper would wake him into listening to MK’s voice seeking an explanation for the slip up. Owners of media reporting wrongly about him or his government or his party, too, would get calls pointing out the injustice done to him. His human relations — within and outside the party — would entice and entreat, captivate and compel the target into compliance. His personal touch made mutual adversaries within the party unwaveringly loyal to him. His wit and sarcasm won the admiration of the most difficult customer, the media, and equally floored his competitors within and adversaries without alike. If his unparalleled oration captivated millions in his party and lured its supporters, his skill and alertness unnerved those who would think of stepping out of the line. A dictator who democratised dictatorship within the party, he was extremely loved and intensely loathed. He was a contrast too. But his brilliant repartees and quick wisdom would overshadow and justify all contradictions and contrasts in him. Rising from an oppressed ecosystem of the Tanjore district, he had a continuing dislike for traditions and Brahmins, while, in contrast, he loved heritage and culture, unlike the communists who hate both. Decidedly not a nationalist, but not a separatist too, MK yet kept alive a lurking sense of emotional separatism by his clever wordplay and deed. In the process, he became a suspect in the eyes of both. A serious negative, even dangerous, contribution of MK to Tamil Nadu politics was his improvement of secular politics from being just sensitive to the minorities to becoming insensitive to the majority — which has whetted the appetite of a section of the minority with anti-Hindu rhetoric. Unwavering to his friends, he was unforgiving to them if estranged — the famous illustration being his unremitting enmity to MGR which the latter reciprocated equally, making Tamil Nadu politics polarised around two parties, and between two leaders who would not even look at each other. The MGR vs MK personality clash defined Tamil Nadu politics in the late 1980s and early 1990s, when the anti-DMK — read anti-MK — constituency became a political reality that worked in favour of MGR. And later, burdened as MK was with LTTE’s shadow and the murder of former prime minister Rajiv Gandhi, it worked in favour of Jayalalithaa, who inherited the popularity of MGR and the enmity of MK together. In over four decades of DMK vs AIADMK rivalry, the fault lines of MGR-Jaya vs MK also became the dividing line between the regional drift and the national current in which the AIADMK subsumed the nationalist stream, leading to the marginalisation of the only relevant national party, the Congress. Result, the AIADMK became the nationalist regional party, and DMK remained the regionalist regional party. Half a century of Tamil Nadu politics shaped by intense personal rivalry between the tallest leaders on either side of the divide is now poised for an uncertain future. Intense mutual hate has been the grammar of the DMK led by MK and the AIADMK led by MGR, succeeded by Jaya, which shaped the political culture and behaviour of the cadre on both sides. The AIADMK without its tallest leaders and the DMK without MK suddenly face the need for a cultural shift to manage their future. How the cultural shift would occur, and how the two parties will manage to navigate through it, only time can tell. Tamil Nadu’s politics, frozen between the two parties, may melt down and open the closed territories for new players who are on the horizon — including the national players, the Congress and the BJP. The 2019 Lok Sabha polls will be the first major test for both parties bereft of the imposing leaders who had led them with an iron fist. Interesting time ahead for Tamil Nadu. Mr Gurumurthy was magnanimous enough not to touch upon the notorious role of MK's liberty of Print media and freedom of expression. MK was unpaid Circulation Manager of Thuglak Tamil fortnightly magazine, when in 1970s he forfeited all the copies of Thuglak issues and tried to stop it. Shri Cho S Ramaswamy with the active backing of Ramnath Goenka of Indian Express Group thwarted his nefarious designs. This guy MK being five time CM of TN refused to received IPKF in 1991 returning from Sri Lanka and alleged without evidence that IPKF indulged in genocide of SL Tamils. MK was sole beneficiary of associating with anti national / anti social elements like LTTE, Madani, Sandalwood smuggler Veerappan. For MK, national interest is the lost priority. He has damaged the future of five generations of talented tamilians through 69% Reservation in Education, Employment, job promotion etc. and opposing Navodaya Schools and teaching of Hindi in TN Schools as an OPTIONAL SUBJECT to whoever is interested in learning Hindi. All other Indian States follow three language formulae except TN to the detriment of Tamil students over all interest. His entire clan is proficient in Hindi, what is good for them is NOT good for Tamilians. Another indelible scar on MK is allowing the barbarious attack and pulling of saree of LOP J Jayalalitha in the hallowed precints of TN Assembly and his Govt was rightfully sacked using Art 356 by Chandrashekar Govt in 1990 based on the advise of Dr Subramanian Swamy for his anti national activity of passing on national secrets / IB Alerts to LTTE clandestinely. Thankfully, the former President of India Dr APJ Abdul Kalam spiked / nixed the idea of conferring the title of Bharat Ratna on this Anti National thug and in revenge he refused to back his candidature for second term of Dr APJ Kalam as President of India. Had he been conferred Bharat Ratna title on MK as demanded by his partymen [IN THAT CASE, IT WOULD BE CONSTRUED AS VAANGAPPATTA VIRUDHU / PURCHASED HONOUR-BR TITLE AND NOT VAZHANGAPPATTA VIRUDHU / CONFERRED BR TITLE, USING HIS OWN STYLE & LANGUAGE OF CRITICISING HIS POLITICAL OPPONENTS ], then Gangster Dawood Ibrahim is also equally eligible for the title of Bharat Ratna. To conclude, the natural death of MK is a good riddance and we should erase his (mis)rule of TN from our memory and proceed further. Road ahead for people of Tamil Nadu. There is a political vacuum in TN with the demise of JJ & MK. Please should vote for politicians having talent and unblemished track record in the service of people without distinction of caste, creed, colour, religion, etc with Nationalistic outlook. A question was put to MK Gandhi, whether people should vote for a candidate who is good, but in a bad party OR to a bad candidate having notorious traits but in a good party. MK Gandhi replied that PEOPLE SHOULD VOTE FOR A GOOD CANDIDATE BELONGING TO A BAD PARTY, BECAUSE A GOOD CANDIDATE WILL RETAIN HIS NOBILITY OF CHARACTER ALWAYS, EVEN IF BELONGS TO A BAD PARTY. UNDESERVED & UNNECESSARY SEVEN DAYS STATE MOURNING DECLARED IN TN OVER TODAY (14-08-2018) AND I WISH ALL OUR PATRIOTIC CITIZENS A HAPPY INDEPENDENCE DAY GREETINGS. All said and done what positive changes have happened on common man’s life for helping in assuring life of having a harmonious, happy family life. Not withstanding all of MK s indefatigable political journey - one of the longest in India. What made an inspiring personal experience in me is his Ramanujar script, so beautifully done and televised. Indeed he was indefatigable in scripting Ramanujar as he was close to his 90s. Why did he hate the Brahmins and ridicule the Hindu Gods ?? I am surprised by the Mr.gurumurthy's praise on Late CM KarunaNidhi who does not deserve any Praise all. A Pseudo secularist and who wanted Chidambaram and SriRangam temple to be blown off and called that day will be golden day, does such persons deserve praise?.when a Media asked Mu.Ka on important File was missing, reply came-open "Unrobe womens Nada, you will find it, such was his filthy reply and respect for Women. When Late PM Indra Gandhi was hit on the Head and bleeding he commented " she must be on Periods and it may be Women's Period blood. Does he Deserve Praise?. Next was JJ incident in the Assembly. Only I admire him for his tireless party service and Workaholic. But He is 5 term as CM , he had fooled and brainwashed people of TN to stay in Power. Indian's one of the Most Corrupt CM. Ruthless man, who does not blink to finish his own partymen( Ku Pa Krishnan Murder is an example). Tasmac was brought bye him. Does he deserve Praise?. 2G scam King. Mr,Gurumurthy we are Saddened by your Column. Had CHO would have alive even he would not have praised Karunaidhi except on his Tireless Work. Incomplete and worthless article.SG should have commented on MK's family corruption turning the DMK into personal fiefdom bramhin-hatred and so many. During 1982-85 or so , when Late MGR was the Chief Minister, DMK swept local polls to Municipalities, Panchayats etc held in that period in Tamil Nadu. MGR was totally frustrated and angry with his own party members for the massive defeat. Therefore it can not be said that when MGR was the Chief Minister, Late MK and DMK could not win any election. But AIADMK won the Assembly elections held later on . MK and DMK could not do anything there. Very well written article ,however, author has not revealed his other features vis a vis National features . MK might have been under influence of church or forces who had little sense for National importance. Perhaps the best tribute to late Sri MK without any exaggeration in the praise or reference to the limitations of the DMK hero of the century gone by. Very impartial to the man who marked himself as the best strategist in the evolving politics of the nation, without mincing words on his slips and stumbles that didn't work to his fall anyway. My respect to Sri Guru's fairness is reiterated in this excellent article.